The College’s 250th anniversary celebrations have already begun, and among the concerts, free food and green-lit photo ops that some students have had the opportunity to enjoy, there is another aspect of the celebration perhaps more relevant to the Dartmouth student experience: special 250th anniversary courses. These special courses, which students may search by selecting the “Dartmouth 250” option on the online timetable of classes, feature the College in their curricula, and students taking the courses are prompted to reflect on their own Dartmouth experiences as they analyze aspects of the College’s past and present in a critical light. This winter, two sestercentennial-themed courses are being offered: Religion 7.08, “Is Dartmouth a Religion?” and “Daniel Webster and the Dartmouth College Case,” which is cross-listed among four departments: college courses, english, government, and history. “Is Dartmouth a Religion?” is a first-year seminar taught by religion professor Susan Ackerman. As with any good course whose title is a question, there is no single correct answer, but students will spend the term thinking about some of the motifs and themes that repeat across different religious traditions before offering their own answer in the form of a final paper. Ackerman said — or, in her words, “confessed” — that her inspiration for the course came from a similar course offered at Stanford. Thanks to Dartmouth’s long history and its single founder figure, Eleazar Wheelock, applying the same question to our campus leads to countless possible discussions and viewpoints. While some may think it is obvious that no, of course Dartmouth isn’t a religion, our attachment to a unique set of rituals provides evidence suggesting otherwise. The course is divided into three main units: religious founders, sacred space and ritual. The first half of each unit is dedicated to general religious ideas, while the second half of each consists of students applying what they have learned to Dartmouth and its history. For example, Ackerman expressed that religious traditions adapt to political circumstances, such as when the pronouns of popular hymns are adapted to become more gender-inclusive. What about when the words of the Alma Mater changed to include both “sons” and “daughters” of Dartmouth? How can a close study of different world religions change and enhance how we view the College? Of course, as Ackerman noted, you can’t study the Alma Mater until you know the lyrics — something that students in a previous first-year seminar she taught did not. In addition to improving their writing skills, as they would in any first-year seminar, she also hopes that her students will learn more about the school where they’ll be spending the next four years of their lives. The significance of the case, however, far exceeds its most famous line, and Pease explained that it propelled into “black letter law” important legal concepts such as sanctity of contract, due process and the distinction between church and state. The course is divided into distinct Tuesday and Thursday blocks. On Tuesdays, one of the three professors gives a lecture for around 45 minutes, and then the rest of the class consists of a debate between all of the courses’ professors, directed by challenging questions. That same Tuesday night, students submit their own interventions and critiques online. Those submissions become the basis for the student-based discussions and debates that happen every Thursday. For the students enrolled, the highlight of the course is easily a two-day trip to Washington, D.C. at the end of this month, culminating in a live reenactment of the case on Thursday, Jan. 31 in front of Chief Justice John Roberts. Former Solicitors General Neal Katyal ’91 and Greg Garre ’87 will play the roles of Daniel Webster and William H. Woodward, respectively, before an audience of students, faculty and over 270 alumni. Another highlight is a conference hosted by students at the end of the course, in which they will give 15-minute presentations of their final papers to constitutional lawyers who have written about the Daniel Webster case. Pease said that he has already been impressed by the animated discussions in the class so far, and he is excited for what the rest of the term has to bring. While only two special 250th anniversary courses are being offered this term, many more will come later. One such course, which will be taught by English professor James Dobson this spring, is about Dartmouth fictions. That is, literature about Dartmouth written mostly by alumni — Dobson’s definition of “fiction” is inclusive, and memoirs, poetry and short stories are included in the course curriculum as well. Dobson has taught freshman Writing 5 classes about Dartmouth in the past, and he suggested this course in part because he hopes to have a larger, more literary-focused class. He mentioned that this course was timed to align with seniors in their last term at the College, and he hopes seniors taking it are able to reflect on their four years and compare and contrast them with others’ depictions of the Dartmouth experience in literature. 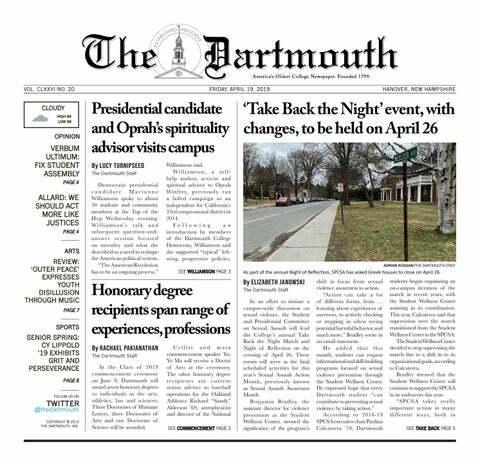 Dobson noted that there is a surprising number of books about Dartmouth, including memoirs like “The Plastic Age” by Percy Marks, in which experiences like the Homecoming bonfire, sports excitement and fraternity parties are depicted not unlike they are today, nearly a century later. Other books that Dobson listed include “It’s Different at Dartmouth” by former College first lady Jean Kemeny, “The Real Animal House” by Chris Miller ‘63 Tu ‘64 and “Confessions of an Ivy League Frat Boy” by Andrew Lohse ’12. According to Dobson, the first piece of fiction about Dartmouth was actually by a Princeton student who, after reading an article about Dartmouth students protesting bad meals and housing, wrote a mock epic poem in which he depicted Dartmouth students as rowdy hooligans who got drunk and tore down buildings. Throughout all of these works, familiar images like the wilderness appear again and again. Dobson recognizes that Dartmouth students and alumni are passionate and have a strong voice, and he believes that looking at Dartmouth as a place is an important way for students to consider the past and recognize the future culture and community they desire.